In early March, in central Berlin, I came across a demonstration protesting against ‘Neo-Nazis on the Maidan.’ I tried to talk to the activists standing there, but they responded to all of my comments with just one question: ‘Are you a member of the fascist Svoboda party?’ Up to that point, I had not realised the scope of Putin’s propaganda in Germany, and the fact that the topic of Ukraine will soon become one of the major division lines inside German society. I have been following various public discussions and debates, from the Bundestag to the Day of German Historians, and from the Berlin Poetry Festival to the German teachers conference, and I have come to understand better, German attitudes to the situation in Ukraine, usually defined in German media as the ‘Ukraine Crisis.’ Looking at the pro-Putin segment of German public discussion, one can identify the target groups and methods of Russian disinformation politics as well as the cultural stereotypes it is based on. ‘The responsibility for the Ukraine crisis lies with the West.’ This belief relies on the presumption that the West itself has violated the principle of the inviolability of borders. It is said that while the West has supported and recognised the independence of Kosovo, it has also challenged the international power balance by enlarging NATO up to the very borders of Russia. Using this historical analogy, ‘the self-determination’ expressed during the Crimean ‘referendum’ is often equated to the self-determination of Kosovo. But, at the same time, the choice of the majority of Ukrainians, voting in favour of European integration, is portrayed as being imposed from the outside (the notion of ‘American money for the Maidan’ is often raised in this respect). And the EU is blamed for promoting ‘unrealistic expectations’ of Kiev, and thus provoking Putin. This logic usually stresses the need to take into consideration the ‘legitimate interests of Russia’ in the post-Soviet space. This means therefore that the conflict in Ukraine should be solved ‘not against Putin, but together with Putin’ (a quotation from a speech on the ARD TV-show given by retired NATO general Harald Kujat). ‘In Ukraine we are dealing with a civil war between the East and the West of the country caused by the nationalism of the Kievan post-Maidan government.’ This image is based on an intensively promoted description of Ukraine as a deeply divided country where the pro-European and, at the same time, ultra-nationalistic ‘West’ stands against the pro-Russian or just Russian ‘East.’ Ukraine here is depicted as a failed state, the accidental outcome of the collapse of the Soviet Union and a country with no historical and cultural agency of its own. In other words, Ukraine is seen as just a battleground for the real superpowers. The notion of the 'civil war' also helps to downplay the question of the Russian intervention; and a comparison of Ukraine to Czechoslovakia promotes the idea of a peaceful divorce as a desirable solution. Ukraine is seen as just a battleground for the real superpowers. ‘Germany should avoid a new war, especially if there is a danger of nuclear weapons being used.’ Avoiding a war in this case involves making concessions to Putin, showing peaceful intentions and the will to talk. This logic is built on the European culture of political consensus, and overlooks the fact that every sign of indecision and weakness only encourages further aggression from the Kremlin. 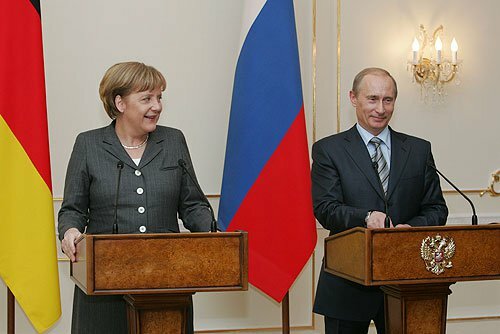 There are also fears of a totally unpredictable and chaotic ‘Russia without Putin.’ They influence the orientation and preference of German politics for keeping the option of ‘letting Putin save face,’ and a return to ‘business as usual.’ This orientation ignores the effects of the war propaganda campaign inside Russia and the nature of Putin`s political legitimacy, which has to move from one geopolitical victory to another to remain acceptable to the majority of the population. ‘The economic and historical aspects of German-Russian cooperation should not be sacrificed in favour of an obscure, distant and weak Ukraine.’ This view is based on the belief that Ukraine’s problems are somehow local (see the idea of the ‘civil war’ mentioned above), and thus bear no real threat to Germany. And yet the worsening of relations with Russia is seen as a real threat – economically, militarily and culturally. According to this reasoning, Ukraine appears as just a petty obstacle to the long-lasting search for the mutual understanding and cooperation between Germany and Russia. Such logic, for instance, was evident in West German politicians’ attitudes to Polish Solidarity during the 1980s. ‘The criticism of Russian politics in Ukraine is a new form of russophobia.’ As a Ukrainian academic and commentator, I am constantly trying to prove the opposite: uncritical support or unwillingness to confirm the fact of Russia`s aggression against Ukraine is a kind of russophobia, because it pushes Russia to the point of economic and political collapse, and denies the democratic potential of its development. The views above are not simply products of the Kremlin’s propaganda efforts, but result from a genuine desire to prevent the worse-case scenario and further Germany national interests. The supporters of such an attitude do not constitute a homogeneous social or political group. Among them are people on the left, particularly voters of the Die Linke Party. But that does not mean that the entirety of the German left is pro-Putin, because the Green Party enthusiastically supports Ukraine. There are also some representatives of German business, especially those closely related to the Russian markets, and there are people of conservative views who are often sceptical towards further enlargenment of the EU. These people are represented politically by a new right-wing political party — Alternative for Germany. The German cultural backgrounds of pro-Putin attitudes are many and varied. Anti-American sentiments, for example, especially among the leftist German circles that, as Anna Veronica Wendland put it, point to imperialism in the West, but completely fail to notice it in the Russian politics on the post-Soviet space. There is the German post-war culture of consensus and pacifism, which believes that negotiations are always better than a coercieve approach, that peace should be established by peaceful actions only, and every conflict could be solved if all sides will drink enough coffee together. Unfortunately, this approach does not explain what to do if one of the sides, especially when it is not recognised as an aggressor, does not keep its promises and constantly uses violence to establish facts and advantage on the ground. Such pacifism tends not to notice somehow the military involvement of Russia, and sees the deliberate presentation of the war in Donbas as a kind of ‘legitimate fight for self-determination’ as being in some way comparable to the Kurdish, Catalonian or Scottish independence movements. There is the historical stereotype of Eastern Europe as a terrain of political chaos, ethnic nationalism and anti-semitism. Putin`s propaganda tends to depict the current events in Ukraine according to this recognisable image of ‘Eastern Europe,’ which also includes Poland or the Baltic states, but not Russia. There is the historical guilt towards Russia felt by a lot of Germans in relation to the Nazi atrocities committted during the Second World War. In German mass consciousness, the war in the East – that actually took place mostly on the territories of present-day Belarus, Poland and Ukraine – is perceived as a ‘war in Russia.’ But German historical guilt towards Ukraine, twice occupied by German troops during the 20th century (first in 1918 and then in 1941-1944), is practically absent in the evaluation of the current events. Finally, there is the weakness of cultural and historical links with Ukraine caused, among other factors, by the lack of institutionalized Ukrainian studies in Germany and the shortage of Ukrainian cultural initiatives in the West. Looking at all of the above, the most important conclusion is that for a lot of Germans, Ukraine has no historical and cultural agency of its own and is treated as just an instrument for stronger powers competition or a function of the anti-American or anti-EU sentiments. Kremlin propaganda in Germany tends not to directly promote widespread acceptance and sympathy towards Putin’s politics, but to spread fear and disorientation. This propaganda is designed to prevent political and social consensus on Germany’s position towards Ukraine, and thus resistance to Russian intervention. Despite its variety, the principal aim of the pro-Putin discourse in Germany could be summarised in one word — non-interference. According to this logic, Ukraine should not expect NATO membership in the future, nor Western military assistance. The prospects of Ukraine’s EU membership can only be mentioned as a distant and vague possibility. At the same time, the sanctions against Russia should be abandoned (or at least not expanded) in order to overcome a ‘new cold war.’ But such an approach gives no clear vision of the future to Ukraine: how it could exist as a ‘bridge’ between conflicting integration projects (the EU and the Eurasian Economic Union). ‘Those who understand Putin’ (Putinversteher) constitute a heterogeneous group of influential ex-politicians (such as ex-chancellors Helmut Schmidt and Gerhard Schroeder), as well as journalists, political experts, businessmen and people within the German military. They are particularly visible on German TV talk shows and social media, where they attack every pro-Ukrainian publication or comment. Notwithstanding the Putinversteher, it seems that, despite their best efforts, there is a growing understanding in Germany that Putin`s politics do have a global dimension. After all, his politics question all existing international institutions and the entire system of international law. In this sense, Russia’s intervention in Ukraine and the ensuing global information war poses a number of challenges to the EU (especially given its complicated decision-making process): how should democracies stand up to an authoritarian nuclear power? How can pacifism prevent war with a violent aggressor? And how can freedom of speech deal with disinformation?